There's a lot to do at Doheny Beach besides gaze at the sea. When you're not hanging around your campsite, you'll find tide pools to explore and a visitor center with several aquariums. Or you could set up a net and play beach volleyball. Surf fishing is also popular. You can also visit nearby Dana Point Harbor to rent a boat or take a whale-watching trip. Swimming and surfing are also popular with campers at Doheny State Beach. Smaller waves make Doheny a good place to learn to surf. Lifeguards patrol the beach year-round. Lifeguard towers are staffed roughly from Memorial Day weekend through Labor Day weekend. Some people love to camp at Doheny Beach because it's so close to the ocean. Others complain that it's too crowded. If you stay in the campsites that are furthest from the beach, you may hear a lot of noise from passing trains. Others don't think it's clean enough. People who try to camp in tents complain about how much noise the RV campers make. That's a confusing bunch of contradictory statements, I realize. The best way to decide whether it's right for you is to read some of the reviews of the Doheny Beach campground at Yelp. What Facilities Are There for Camping at Doheny State Beach? Doheny State Beach has 16 RV sites for trailer and RVs up to 35 feet long. It also has 100 tent sites. All of the campsites are non-hookup “dry camping” sites. Restrooms and showers are available, and there's an RV dump site. WiFi is available, but only at the concession stand. If you'd love to stay at Doheny State Beach but don't have an RV, try Luv2Camp. They can deliver and set up an RV for you. California State Park campgrounds require reservations and navigating a reservation system that seems like it could have been designed by an evil mastermind. To start, you'll have to pick your date as much as six months in advance. Our guide to California state parks reservations will show you how. It's such a competitive thing that a few minutes wasted picking the perfect site can be the difference between getting a spot and missing out. To get ready to make that reservation as soon as they are available, check the campground map and views ahead of time. The campsite fee covers one motor vehicle and one legally towed-in vehicle. You may register three vehicles (trailers and/or cars) for each campsite. Extra vehicles pay an extra fee. Sites 37 through 94 are closest to the ocean and have direct access to the beach. Site 29 may look like it's on the beach and it is next to water, but that's the San Gabriel River, not the ocean. People who have RVs with side sliders say some of the spaces are very narrow. Look for a wider spot on the map if you need it. If you have a generator, you will have to turn it off during nighttime quiet hours. Some campers suggest bringing water shoes if you want to go into the ocean, to prevent hurting your feet on the rocky bottom. Dogs are allowed in the campground for free, but they must be leashed and attended at all times, and they can't go on the beach. Dogs must also be kept inside your vehicle or tent at night. The area gets very busy during the Doheny Blues Festival in late May. 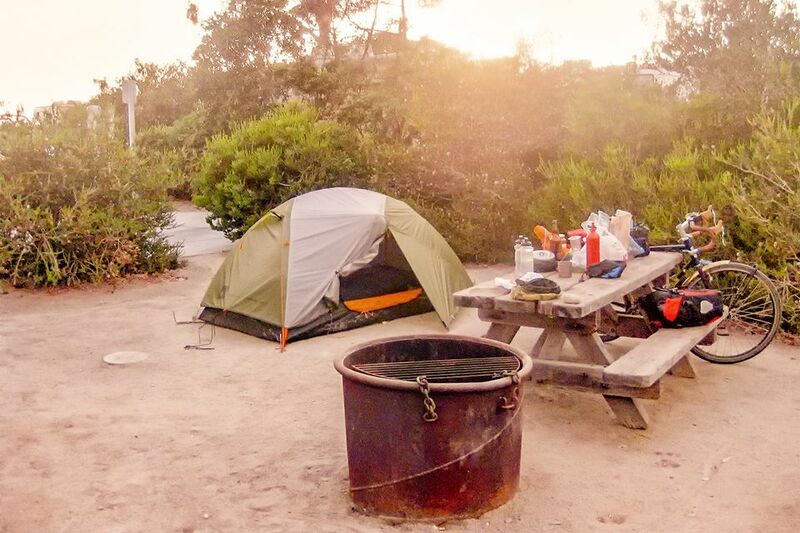 You can find more places to go beach camping in Southern California coast using this guide.